How much do you know about your tank water heater? It’s an appliance you likely use every day, but rarely think about. Hot showers, hand washing, laundry, and dirty dishes all require the use of your hot water heater. Try counting how many times you turn on the hot water daily. The number might surprise you. It’s the second biggest energy hog behind your HVAC system, accounting for around 20% of the monthly average in U.S. homes (U.S. Energy Department). There are two kinds of tank-model water heater systems: gas and electric. Both water heating units look alike on the outside, save for the chimney running through the middle of the gas version. Understanding how they work and their basic components will help with future maintenance and repair issues. Here is a list of essential water heater components. Get acquainted with the basics to save yourself both time and money when a water heater issue arises. The metal tank is the inner shell of a water heater. It contains a protective liner that holds from 40 to 60 gallons of hot water. This translates to around 50 to 100 pounds per square inch (PSI), within the pressure range of a typical residential water system. The tank is covered on the outside by an insulating material (like polyurethane foam) and then covered again by a decorative outer shell. The water enters the tank through the dip tube (at the top of the tank) then travel to the bottom where it is heated. This component stops the water flow into the tank. This separate piece is located outside and above the unit. This pipe is suspended down into the tank, carrying the hot water into the home. A more accurate term is a thermometer, but it is also a temperature-control device. Certain electric units have a separate thermometer for each element. This is where the two units differ. An electric unit has an internal element inside the tank to heat the water. Gas units have a burner and chimney system. This is a component exclusively for a gas unit. The drain valve is located near the bottom of the tank and used primarily to empty the tank of sediment. A safety device that is connected to an overflow pipe running down the outside of the tank. It helps keep the temperature and pressure inside the tank within safe limits. This component, made of magnesium or aluminum with a steel core, keeps the interior of the tank from corroding. Print this page out and locate each of the items on the list. Then keep the list next to your water heater for easy reference. 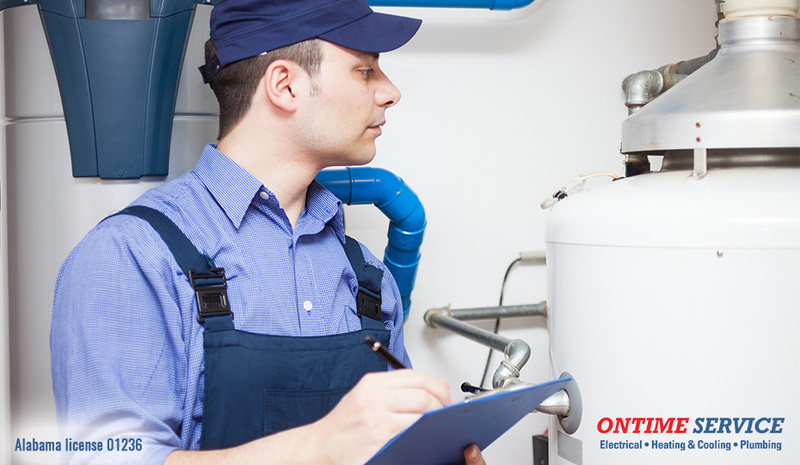 And if you ever need water heater repair, maintenance or installation, call the experts at OnTime Service! For more information on energy savings and expert plumbing advice anytime, contact OnTime Service, serving the Birmingham area since 1975. Follow us on social media for more useful information: Facebook, Twitter, Google+, and Pinterest.